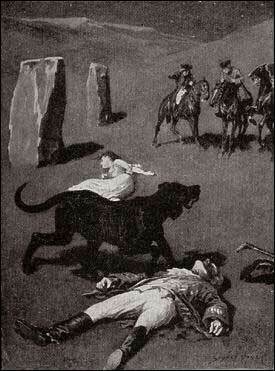 “Of the origin of the Hound of the Baskervilles there have been many statements, yet as I come in a direct line from Hugo Baskerville, and as I had the story from my father, who also had it from his, I have set it down with all belief that it occurred even as is here set forth. And I would have you believe, my sons, that the same Justice which punishes sin may also most graciously forgive it, and that no ban is so heavy but that by prayer and repentance it may be removed. Learn then from this story not to fear the fruits of the past, but rather to be circumspect in the future, that those foul passions whereby our family has suffered so grievously may not again be loosed to our undoing. “Know then that in the time of the Great Rebellion (the history of which by the learned Lord Clarendon I most earnestly commend to your attention) this Manor of Baskerville was held by Hugo of that name, nor can it be gainsaid that he was a most wild, profane, and godless man. This, in truth, his neighbours might have pardoned, seeing that saints have never flourished in those parts, but there was in him a certain wanton and cruel humour which made his name a byword through the West. It chanced that this Hugo came to love (if, indeed, so dark a passion may be known under so bright a name) the daughter of a yeoman who held lands near the Baskerville estate. But the young maiden, being discreet and of good repute, would ever avoid him, for she feared his evil name. So it came to pass that one Michaelmas this Hugo, with five or six of his idle and wicked companions, stole down upon the farm and carried off the maiden, her father and brothers being from home, as he well knew. When they had brought her to the Hall the maiden was placed in an upper chamber, while Hugo and his friends sat down to a long carouse, as was their nightly custom. Now, the poor lass upstairs was like to have her wits turned at the singing and shouting and terrible oaths which came up to her from below, for they say that the words used by Hugo Baskerville, when he was in wine, were such as might blast the man who said them. At last in the stress of her fear she did that which might have daunted the bravest or most active man, for by the aid of the growth of ivy which covered (and still covers) the south wall she came down from under the eaves, and so homeward across the moor, there being three leagues betwixt the Hall and her father’s farm. “It chanced that some little time later Hugo left his guests to carry food and drink — with other worse things, perchance — to his captive, and so found the cage empty and the bird escaped. Then, as it would seem, he became as one that hath a devil, for, rushing down the stairs into the dining-hall, he sprang upon the great table, flagons and trenchers flying before him, and he cried aloud before all the company that he would that very night render his body and soul to the Powers of Evil if he might but overtake the wench. And while the revellers stood aghast at the fury of the man, one more wicked or, it may be, more drunken than the rest, cried out that they should put the hounds upon her Whereat Hugo ran from the house, crying to his grooms that they should saddle his mare and unkennel the pack, and giving the hounds a kerchief of the maid’s, he swung them to the line, and so off full cry in the moonlight over the moor. “Now, for some space the revellers stood agape, unable to understand all that had been done in such haste. But anon their bemused wits awoke to the nature of the deed which was like to be done upon the moorlands. Everything was now in an uproar, some calling for their pistols, some for their horses, and some for another flask of wine. But at length some sense came back to their crazed minds, and the whole of them, thirteen in number, took horse and started in pursuit. The moon shone clear above them, and they rode swiftly abreast, taking that course which the maid must needs have taken if she were to reach her own home. “They had gone a mile or two when they passed one of the night shepherds upon the moorlands, and they cried to him to know if he had seen the hunt. And the man, as the story goes, was so crazed with fear that he could scarce speak, but at last he said that he had indeed seen the unhappy maiden, with the hounds upon her track. ‘But I have seen more than that,’ said he, ‘for Hugo Baskerville passed me upon his black mare, and there ran mute behind him such a hound of hell as God forbid should ever be at my heels.’ So the drunken squires cursed the shepherd and rode onward. But soon their skins turned cold, for there came a galloping across the moor, and the black mare, dabbled with white froth, went past with trailing bridle and empty saddle. Then the revellers rode close together, for a great fear was on them, but they still followed over the moor, though each, had he been alone, would have been right glad to have turned his horse’s head. Riding slowly in this fashion they came at last upon the hounds. These, though known for their valour and their breed, were whimpering in a cluster at the head of a deep dip or goyal, as we call it, upon the moor, some slinking away and some, with starting hackles and staring eyes, gazing down the narrow valley before them. “The company had come to a halt, more sober men, as you may guess, than when they started. The most of them would by no means advance, but three of them, the boldest, or it may be the most drunken, rode forward down the goyal. Now, it opened into a broad space in which stood two of those great stones, still to be seen there, which were set by certain forgotten peoples in the days of old. The moon was shining bright upon the clearing, and there in the centre lay the unhappy maid where she had fallen, dead of fear and of fatigue. But it was not the sight of her body, nor yet was it that of the body of Hugo Baskerviile lying near her, which raised the hair upon the heads of these three dare-devil roysterers, but it was that, standing over Hugo, and plucking at his throat, there stood a foul thing, a great, black beast, shaped like a hound, yet larger than any hound that ever mortal eye has rested upon. And even as they looked the thing tore the throat out of Hugo Baskerville, on which, as it turned its blazing eyes and dripping jaws upon them, the three shrieked with fear and rode for dear life, still screaming, across the moor. One, it is said, died that very night of what he had seen, and the other twain were but broken men for the rest of their days. “The recent sudden death of Sir Charles Baskerville, whose name has been mentioned as the probable Liberal candidate for Mid-Devon at the next election, has cast a gloom over the county. Though Sir Charles had resided at Baskerville Hall for a comparatively short period his amiability of character and extreme generosity had won the affection and respect of all who had been brought into contact with him. In these days of nouveaux riches it is refreshing to find a case where the scion of an old county family which has fallen upon evil days is able to make his own fortune and to bring it back with him to restore the fallen grandeur of his line. Sir Charles, as is well known, made large sums of money in South African speculation. More wise than those who go on until the wheel turns against them, he realized his gains and returned to England with them. It is only two years since he took up his residence at Baskerville Hall, and it is common talk how large were those schemes of reconstruction and improvement which have been interrupted by his death. Being himself childless, it was his openly expressed desire that the whole countryside should, within his own lifetime, profit by his good fortune, and many will have personal reasons for bewailing his untimely end. His generous donations to local and county charities have been frequently chronicled in these columns. “The circumstances connected with the death of Sir Charles cannot be said to have been entirely cleared up by the inquest, but at least enough has been done to dispose of those rumours to which local superstition has given rise. There is no reason whatever to suspect foul play, or to imagine that death could be from any but natural causes. Sir Charles was a widower, and a man who may be said to have been in some ways of an eccentric habit of mind. In spite of his considerable wealth he was simple in his personal tastes, and his indoor servants at Baskerville Hall consisted of a married couple named Barrymore, the husband acting as butler and the wife as housekeeper. Their evidence, corroborated by that of several friends, tends to show that Sir Charles’s health has for some time been impaired, and points especially to some affection of the heart, manifesting itself in changes of colour, breathlessness, and acute attacks of nervous depression. Dr. James Mortimer, the friend and medical attendant of the deceased, has given evidence to the same effect. “Then let me have the private ones.” He leaned back, put his finger-tips together, and assumed his most impassive and judicial expression. “In doing so,” said Dr. Mortimer, who had begun to show signs of some strong emotion, “I am telling that which I have not confided to anyone. My motive for withholding it from the coroner’s inquiry is that a man of science shrinks from placing himself in the public position of seeming to indorse a popular superstition. I had the further motive that Baskerville Hall, as the paper says, would certainly remain untenanted if anything were done to increase its already rather grim reputation. For both these reasons I thought that I was justified in telling rather less than I knew, since no practical good could result from it, but with you there is no reason why I should not be perfectly frank. “The moor is very sparsely inhabited, and those who live near each other are thrown very much together. For this reason I saw a good deal of Sir Charles Baskerville. With the exception of Mr. Frankland, of Lafter Hall, and Mr. Stapleton, the naturalist, there are no other men of education within many miles. Sir Charles was a retiring man, but the chance of his illness brought us together, and a community of interests in science kept us so. He had brought back much scientific information from South Africa, and many a charming evening we have spent together discussing the comparative anatomy of the Bushman and the Hottentot. “Within the last few months it became increasingly plain to me that Sir Charles’s nervous system was strained to the breaking point. He had taken this legend which I have read you exceedingly to heart — so much so that, although he would walk in his own grounds, nothing would induce him to go out upon the moor at night. Incredible as it may appear to you, Mr. Holmes, he was honestly convinced that a dreadful fate overhung his family, and certainly the records which he was able to give of his ancestors were not encouraging. The idea of some ghastly presence constantly haunted him, and on more than one occasion he has asked me whether I had on my medical journeys at night ever seen any strange creature or heard the baying of a hound. The latter question he put to me several times, and always with a voice which vibrated with excitement. “I can well remember driving up to his house in the evening some three weeks before the fatal event. He chanced to be at his hall door. I had descended from my gig and was standing in front of him, when I saw his eyes fix themselves over my shoulder and stare past me with an expression of the most dreadful horror. I whisked round and had just time to catch a glimpse of something which I took to be a large black calf passing at the head of the drive. So excited and alarmed was he that I was compelled to go down to the spot where the animal had been and look around for it. It was gone, however, and the incident appeared to make the worst impression upon his mind. I stayed with him all the evening, and it was on that occasion, to explain the emotion which he had shown, that he confided to my keeping that narrative which I read to you when first I came. I mention this small episode because it assumes some importance in view of the tragedy which followed, but I was convinced at the time that the matter was entirely trivial and that his excitement had no justification. “It was at my advice that Sir Charles was about to go to London. His heart was, I knew, affected, and the constant anxiety in which he lived, however chimerical the cause of it might be, was evidently having a serious effect upon his health. I thought that a few months among the distractions of town would send him back a new man. Mr. Stapleton, a mutual friend who was much concerned at his state of health, was of the same opinion. At the last instant came this terrible catastrophe.